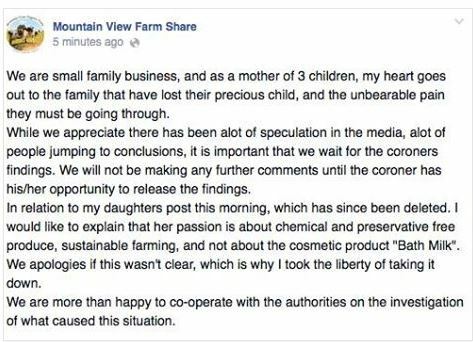 A child died after drinking raw milk. Most responsible organisations and companies when notified that one of their products had killed somebody would show some level of contrition, and might even suggest that they would investigate and change their manufacturing and distribution procedures to avoid such a tragedy happening again. If, however, you're a producer of a dangerous product that you think you can put onto the market by exploiting loopholes in the law you would simply say "We told people not to do that" and declare that it was business as usual. 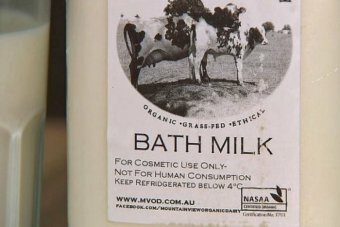 Mountain Valley Organic Dairy put unpasteurised milk in 2 litre containers which are identical to those used to package pasteurised milk and they labelled the milk "Bath Milk" in order to pretend that they were selling this as some kind of cosmetic product. They put "Not for human consumption" on the label and claim that that is the limit of their responsibility. They also stated that the milk should be refrigerated until consumed, as if it is normal to refrigerate cosmetics. So not only do they knowingly sell a dangerous product, but they expect it to be displayed in stores right next to safe products. Another legal loophole that they exploited is that it is apparently legal to supply raw milk to dairy farmers from farms that they own, so these people set up a sham collective where people could pretend to be shareholders. There is sometimes doubt about whether the sellers of such things as medical quackery and psychic readings know that they are doing something wrong, because perhaps they are merely operating out of ignorance or anecdotal personal experience. This doubt is removed when you find someone deliberately misleading consumers by the appearance and labelling of packaging, or paying lawyers to find legal ways of defining customers as something else. The sale of unpasteurised milk should be banned. It is more dangerous than some of the illegal drugs that occupy so much of the time of police and the courts, and I very much doubt that labelling packages of cocaine or methamphetamine as "Bath Salts" and "Not for human consumption" would result in the judge saying "OK then, case dismissed". 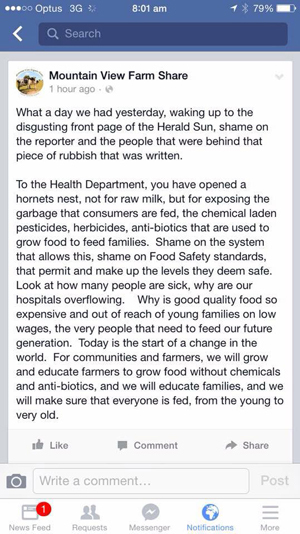 Well, a few days ago a child died in Victoria as a result of drinking raw milk, and several other children were made sick by drinking the same product. The milk was packaged in two litre containers, just as pasteurised milk is, but was labelled "Bath Milk" and promoted as supposedly being only for cosmetic use. The dairy farm that produces this stuff has denied all responsibility and has continued to claim that it was obvious that the milk was intended for washing in not for drinking. The health food shops which sold the rubbish have been silent. Supporters of pseudoscience have been carrying on about the healthy aspects of raw milk and how pasteurisation affects the nutritional quality of milk. There are very good reasons why raw milk cannot be sold to the public, but the scoundrels who produce, package, distribute and sell this stuff had managed to get some good legal advice about how to get through loopholes in the law. One of these ways is the way the milk is labelled. They can then claim it is totally the responsibility of the end purchaser to keep the milk in its standard milk packaging away from children and only store it in the bathroom in the same secure cupboard as the bleach for cleaning the toilet. Oh, and keep it refrigerated. Another loophole in the law allows dairy farmers to drink unpasteurised milk from farms that they own, so the charlatans have set up a facade of a cooperative where people buy shares in order to pretend that they are part owners of the dairy. The fact is that this concession to dairy farmers is only supposed to apply to drinking milk within a very short period following milking, not several days later when the pathogens in the milk have had time to reproduce. And, of course, there is the obligatory lying with the truth ï¿½ the dairy farm makes a lot of noise about how their cows are "grass fed", relying on the ignorance of consumers who may not be aware that all dairy cattle on all dairy farms are fed on grass. But as the young folk say: "Liars gonna lie". I have seen people who should know better try to put all the blame on the end consumers and the parents of the dead child, but the people who make, distribute and sell this product know exactly what they are doing. They know the product is dangerous and they have obviously spent money with lawyers to find legal ways that they can continue to sell it. I have also seen people expressing sympathy for the parents of the dead child, saying that they have suffered enough. These parents might be ignorant of science or the truth, but I'm not sure that the same sympathy would be shown if they had harmed the child in some other way. They fed their child with something that every rational person knows is dangerous; they fed their child something that is labelled "Not for human consumption"; they didn't for a moment think that the label "Bath milk" meant that they should wash the children rather than feed them the milk. It is almost obscene that someone can use a loophole in the law to sell a dangerous product to the public, particularly when it is obvious that they know the thing is dangerous and they do not care. If Mountain View Farm Share were to decide to go into a different line of business and convert their milking shed into a laboratory for the manufacture of methamphetamine the police would be all over them like a cheap suit and labelling the plastic bags "Bath Salts" and "Not for human consumption" would be ridiculed if offered as a defence in court. "Voluntarily"? Pull the other one. Here is what the Australian Competition and Consumer Commission has to say, and here is the official government announcement of the recall. They volunteered after they were told to. And that web site address in the recall notice and on the bottles of milk? It has been "fixed" so that it no longer works. Mountain View have now closed their Facebook page because they didn't like the comments. It will be a better day when they close their web site selling raw milk and close the business as well. "Ethical"? They wouldn't recognise an ethic if it jumped up and bit them on the face.